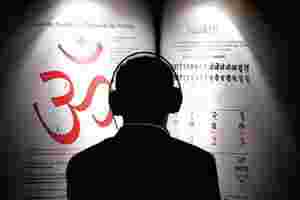 Chord struck: A file photo of a man listening to Sanskrit at the Frankfurt Book Fair. I am engaged in something that I have never done before. I am learning a Sanskrit poem simply by ear, that is, without looking at the text. This is nothing new. Most ancient gurukul traditions are primarily oral. For eons, students learned holy texts simply by listening and reciting. All that changed in 1440 with the invention of the printing press by Johannes Gutenberg. Now, a wealth of verse and literature is available online. One website that I visit, Celextel.org, has codified numerous Sanskrit texts, along with their meanings, in English. I find Sanskrit both daunting and fascinating. Until very recently, I didn’t engage with it in any meaningful fashion. Then one day last month, I decided to learn the Shyamala Dandakam, mostly because I loved D.K. Pattamal’s lilting rendition of it. Musicians can relate to this impulse. You know the feeling: You listen to something so captivating, so haunting that you decide then and there that you must master it. It could be something as simple as a drumbeat or as complicated as, well, a Sanskrit poem. Kalidasa, arguably India’s greatest poet, wrote this verse in praise of goddess Saraswati. For the moment, forget that this is a verse composed by the poet in a moment of religious fervour—something that I am deeply uncomfortable with. For the moment, forget that it is in praise of goddess Saraswati who, in my mind, is not as interesting a god as the conflicted Rama, volatile Shiva or mischievous Krishna. Judged simply as one of Kalidasa’s minor compositions, this is a masterwork. It is composed in a manner called Dandakam, which means it has more than 26 syllables per sentence. In its form, it resembles prose but has the rhythmic gait of poetry. Kalidasa is a fanciful figure. Historians are in two minds about everything about him. I had assumed he was from Kolkata, but apparently not. Some say he is from Ujjain; others say that he roamed Nagpur; some say that he died in Sri Lanka, poisoned by a courtesan. Most agree that he was a village idiot who won the hand of Gupta princess Vidyotama because two scheming scholars presented Kalidasa as a learned man. They helped him defeat the princess in a debate and she was honour-bound to marry him. When the newly wed princess discovered that her husband was a dunce, she threw him out. Kalidasa meditated on goddess Kali, gained enlightenment and returned to his wife who, in a beautiful turn of Sanskrit phrase, asked, “Asti kashchit wagvisheshah?" (Is there something special in your words?) The rest, as they say, is history. Kalidasa rattled off verse after verse, decided that his wife was his guru since it was she who had sent him on the path of enlightenment, and wrote several books with beautiful titles: Raghuvamsam, Kumarasambhavam, Meghadutam. His plays about Malavika, Urvashi and Shakuntala are all still being read by children, albeit in the Amar Chitra Katha versions. He also composed a bunch of minor strotras, one of which is the Shyamala Dandakam that has caught my fancy. Pattamal renders this poem beautifully. I listen to it at Musicindiaonline.com, another portal that I often visit. Until you decide to learn something by simply hearing it repeatedly, you don’t realize how tied we are to the written word and our eyes. I began this endeavour more on a whim than anything else. As a music student, I am used to learning songs by rote, but none so long. The whole exercise can seem tedious: listen, pause, rewind, listen really hard to decipher the words, pause, repeat, rewind to make sure it’s right, repeat, and so on. But I love it. In some senses, it is the same as athletes who vary their exercise routine to flex different muscles. Much of my work involves sitting before the computer and looking at stuff. I wanted to try something different. So I spend 15 minutes each day in this listening and memorizing exercise. I close my eyes and play the song. It focuses my mind in a way that few things do. As a high-strung person, I need all the mental calm I can get. For years, my family has been advising me to meditate. But that’s too boring for me. This song, on the other hand, offers glimpses of the rewards of meditation without the hard work, or lack thereof (after all, you are just sitting and breathing in meditation, aren’t you? It’s not as if you are lifting heavy equipment). I am halfway through the verse now. It rides around my head through the day. As I run down the stairs, I sing it loudly. My children hate it. Even my musically tolerant husband pleads for respite, further proving my belief that musical love is deeply personal: one person’s Dandakam is another person’s poison, to mangle a cliché. I cannot sing it nearly as well as Pattamal. Like any great singer, she knows exactly when to let forth, when to hold back, when to emphasize and when to subdue the voice. It is remarkable to listen to her. The true measure of her gift is apparent if you try to imitate her, what she does so effortlessly, and it comes out horribly. That’s where I am at now. Somewhere up there, Kalidasa must be chortling at my pronunciation. But I plod on.